It’s fairly frequently that we are asked whether we can make them a ‘so and so’ to go in the ‘so and so room’ or similar and the requests range widely but our reply is generally the same – Yes ! as long as it is hand made from wood. Having a wondeful workshop, a talented team of cabinet makers, joiners, painters, polishers and plenty of design flair we can make virtually any piece of bespoke wooden furniture for your home be it fitted or free standing. 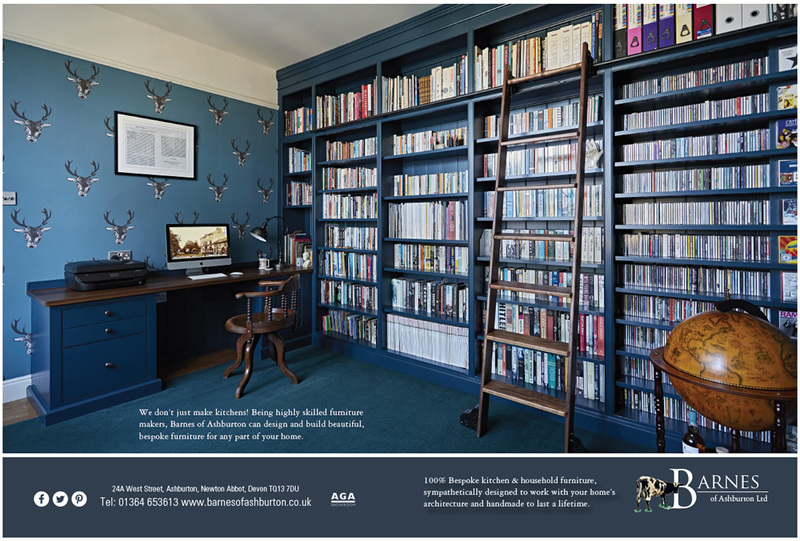 The full height bespoke wooden bookcase featured in Devon Life was handmade to order and built-in to the study room to provide much needed storage for journals, books, magazines, music and more. With a range of shelf heights and a library style ladder to reach the upper rows it has provided an abundance of orderly storage that is easily accessible. Adjoining the bookcase is a traditional executive style desk with oodles of drawer and cupboard storage and a beautiful teak top that exudes a sense of grandeur and timeless appeal. The beauty is that bespoke handmade furniture can be made to measure to maximise the space that you have available. Over the years we have had requests for the usual free standing home furniture items such as beds, benches, butchers blocks, book cases, cabinets, dressers, drawers, pantry cupboards, tables large and small and of course kitchen furniture of all types. In essence, we make wooden furniture by hand for any room of the house. We can work to your plans if you have some or we can create designs which reflect and compliment the individual style and character of our home. Our bespoke furniture design service covers all things to suit the age and style of the property, ranging from classic through to contemporary not forgetting transitional and new takes on old classics. Finishes can include painted, waxed or stained or a mix of the both. So, whatever you have in mind for your home always consider a piece of bespoke handmade furniture from Barnes which will provide a lifetime of enjoyment and durable wear.